@W7VOA "Obama administration sought to normalize relations with a tyrannical dictatorship that targets American citizens, murders and tortures political opponents and tramples upon every freedom known to man," says @AmbJohnBolton. @W7VOA "The Trump administration is proud to announce several further measures we are adopting to reverse the consequences of the disastrous Obama-era policies and finally end the glamorization of socialism and communism," says @AmbJohnBolton in Miami speech. @SecPompeo We denounce Maduro’s refusal to let humanitarian assistance reach #Venezuela. What kind of a sick tyrant stops food from getting to hungry people? The images of burning trucks filled with aid are sickening. @AmbJohnBolton Masked thugs, civilians killed by live rounds, and the burning of trucks carrying badly-needed food and medicine. This has been Maduro’s response to peaceful efforts to help Venezuelans. Countries that still recognize Maduro should take note of what they are endorsing. President Maduro insisted on the need of a high-level regional meeting to discuss all subjects of common interest, including Venezuela. The newly-inaugurated Venezuelan President Nicolas Maduro issued a call for Latin American and Caribbean unity and proposed a special regional presidential summit to debate all issues of common interest. Since Maduro was sworn in Thursday, Venezuela has had to endure a series of diplomatic attacks from countries aligned to United States foreign policy in the region. Paraguay severed diplomatic relations, Argentina issued a statement reiterating the government’s belief that Maduro’s second term is illegitimate, etc. President Maduro ratified Venezuela’s commitment to sovereign regional integration and a “diplomacy of peace.” However, the rise of right-wing government in the region has undermined what was once a regional goal. Last year, six countries temporarily withdrew of the Union of South American Nations (Unasur). Colombia announced its permanent withdrawal and over 6 months later there has been no diplomatic solution and Unasur remains paralyzed. The disintegration of Unasur, led by members of the Lima Group, was crucial to further isolate Venezuela. Buth the Maduro administration has not been passive, instead it has strengthened ties with Caribbean nations and geopolitical players like China and Russia. On Friday, he is expected to hold several bilateral meetings. Maduro has been a vocal critic of the systemic murder of social and community leaders in Colombia’s rural areas. Last year, over 400 were killed with impunity. The Venezuelan head of state also said he was willing to explain to Duque how, after the U.S. Drug Enforcement Administration (DEA) left the country, Venezuela was capable of eradicating coca cultivation. Bolton referred to Palestine a "so-called state,” adding that denying Palestine’s statehood does not undermine the Trump Administration’s plans for peace in the Middle East. United States National Security Adviser John Bolton, on Wednesday, reiterated that Palestine was “not a state,” during an address at the White House. "It's not a state now. It does not meet the customary international law test of statehood," he said. "It doesn't control defined boundaries. It doesn't fulfill normal functions of government. There are a whole host of reasons why it's not a state," the security adviser said. 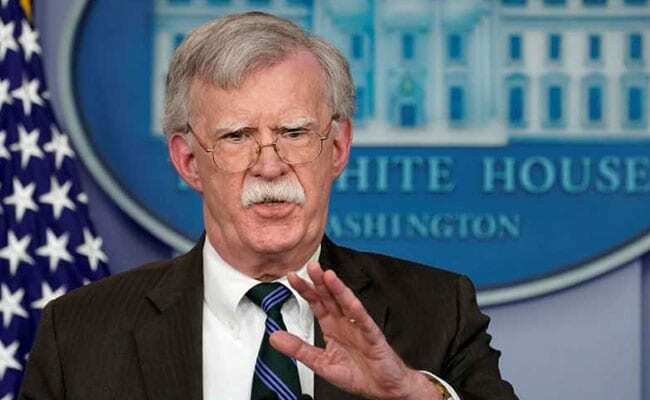 Bolton was resolute in referring to Palestine a "so-called state,” also adding that refusing to acknowledge Palestine’s statehood does not undermine U.S. President Donald Trump Administration’s plans for peace in the Middle East. Last week, the U.S. president said his administration will offer a Mideast peace plan within the next two to four months. "It could become a state, as the president said, but that requires diplomatic negotiations with Israel and others," Bolton added, doubling down on his remarks, saying there was nothing historically remarkable about U.S. officials denying that Palestine is a state. "Calling it the so-called state of Palestine defines exactly what it has been, a position that the United States government has pursued uniformly since 1988 when the Palestinian authority declared itself to be the State of Palestine," he continued. "We don't recognize it as the State of Palestine, we have consistently across Democratic and Republican administrations opposed the admission of Palestine to the United Nations as a state because it's not a state." The Trump administration, in a controversial decision, moved the U.S. embassy to Jerusalem - Palestine’s capital - from Tel-Aviv in May. The Palestinian Authority filed a complaint with the International Court of Justice (ICJ), a United Nations tribunal, to contest the United States’ action. The Palestine Liberation Organization declared independence in 1988 and 137 United Nations member states recognizes the declaration.